If you love basketball, mobile games, and not having to pay for your apps up front or at all, NBA Live Mobile is a title you pretty much can’t miss. As we’re less than a month away from the start of the new NBA season, EA Mobile figured now is the perfect time for a new update which adds some major features and content to an already feature-rich and content-filled game. Among other things, the latest version of NBA Live Mobile boasts improved graphics and a redesigned user interface, better passing mechanics which allow for a more realistic flow of the ball, and a new, fancier system of dunking the ball. Speaking of fancy, the game now also allows for cool alley-oops and has some significantly improved animations. The developers also added shot coaching feedback to the game and are claiming that will help both veteran players and newbies. While these features are already big enough to deserve a standalone update, EA Mobile bundled them with a bunch of additional content to play through. The most important addition in that regard is the new Rookie Program mode designed to offer a realistic and authentic experience of playing with NBA rookies. More specifically, the program boasts 46 rookies which were a part of the 2016 NBA Draft, including the promising Ben Simmons. Once started, this game mode presents the players with daily and weekly goals to complete. Doing so will net them some draft picks and lottery balls which they can use to facilitate their progress. In other words, playing the game often makes playing the game easier as EA Mobile continues to reward daily activity even if you aren’t paying for in-app purchases and aren’t the most skillful mobile gamer in the world. Not surprisingly, the aforementioned graphical improvements are exclusive to more powerful Android devices as generally speaking, NBA Live Mobile is still rather lax regarding both hardware and software requirements. The game will work on most smartphones running Android 4.0 Ice Cream Sandwich and newer and even supports tablets stuck on the outdated Android 3.2 Honeycomb. If that isn’t enough to get you interested in EA’s interactive adaptation of the most popular basketball league on the planet or you simply prefer premium games, you may want to check out NBA 2K18. The spinning movement is done by pressing the Penetration button twice as we move forward or backward. We can make the turn more quickly if we do it at the exact moment to dodge the defense, opening for example the possibility of a mid-distance shot if we hit the Shooting button immediately. To make this move, press the Penetration button once when we are standing and cross the ball between the legs. We can do it if we go in one direction and quickly change to another , however it is quite difficult to perform, so it is more useful and simple to make the spinning motion in its place. As we mentioned on the first page of the guide, we do it by pressing the Marking button when the attacker is in front of us without moving, then our player will attempt the robbery. To make this shot, we haggle towards the bottom line or side and press the Shooting button. To make a hook we press the button of Shot of backs to the basket. Have not you downloaded NBA Live Mobile yet? Do not worry, here are the links to download the Android game on Google Play and for iOS in iTunes. Also, if you know more cheats for NBA Live Mobile Hack do not forget to leave them in the comments, and if you liked the tricks, share it on your social networks! In NBA Live Mobile players are classified by say metals, gold, silver and bronze . Outside of these categories are elite or special event players who will display their names in red. In the game we will see that the players are identified with a number that marks their global ability . If we want to know your specific skills, click on the player and we will see his score broken down into 6 categories: speed, dribble, 3 points, shooting, defense and pass. If you are just beginning the game, you need to build your team. You cannot underestimate the power of a good team. Look out for players with a rating that is above 70 and purchase them for up to 500 coins. Only think about selling players after you have made some good progress. Relying on the AI may seem like the easy way out but it may hinder your progress. The AI is simplistic and may not have your best interest at ‘heart’. If you are not familiar with NBA, you can let the AI select your lineup but as you progress you should be in charge. You need to keep in mind that only you can make the best decisions about your team. Going through the seasons will not only give you achievements but you will also earn numerous coins. Try to go through the seasons as fast as you can before trying other gameplay options. This will ensure that your skills are horned enough. Do not think of it like a task as it will get the fun out of it. Don’t spend your currency as quickly as you get it. It is a good idea to save the in-game currency and only use it for what is necessary. If you save enough, you can buy a star player who will accelerate your progress and make you unbeatable. You can also buy several players to make your lineup strong enough. You can earn coins by playing games since you will get coins even if you lose. At the auctions you can get star players like LeBron James who can turn the tide for you. Try to bid when the timer is about to expire to avoid an extreme bidding war. If you want to win high quality players, you will need to be determined after making the initial bid. This feature can be powerful but only if used in moderation. Use auto-play when you are busy but still want some money from playing games. Most players like using auto play always in defense and they therefore end up having poor defense skills. You need to learn some defensive maneuvers that will give you an upper hand against your opponent. NBA Live mobile hack is a very good user friendly application designed to serve for NBA players . This is an online tool with amazing features and functionality. General users can use our online NBA Live Mobile hacking app to easily get indefinite NBA cash, coins, and money. It has a variety of functions that you must know and we will discuss all of those in this article. For built-in proxy features, anti-theft protection function and prevent the advertising function of the game, it becomes one of the best applications among all kinds of apps on the network.Try consider a factor about banning. A normal user will be easily blocked by the game owner, If he tries to hack. There’s a fact that they don’t need to use the IOS jailbreak tool when they download any Mod APK or install their root device . The anti-ban does have the function of protecting the entire private information from external interference. It is all inbuilt which are undetectable with 100% guarantee. How to Hack NBA Live Mobile Game ? 1. First of all, you need to press the “access to the online NBA Live phone hacking” button. 2. Plug in the game ID or email that is commonly used When you play a live NBA Live Mobile. 3. Click the next button to select the resources you want. For example, you can choose 99999999 NBA cash and coins. 4. You must select the option of anti injunction protection and make sure your account is safe. 5. Now press “Generate” button and wait for few minutes. 6. You have to wait for some time to complete all the tasks before enjoying the hacker NBA Live game. EA Sports production NBA live is widely played game in sports field. People from all around the globe play with PS3, PS4, Xbox, PC etc. After they introduced this amazing game on Android and iOS devices. It is free to download on both Google play app store and iTunes store made by Apple. The game already introduced 5-on-5 Challenge that you can face with opponents. It features Russel Westbrook, a wonderful athlete who belongs to Oklahoma City Thunder. You can easily link the game with friends and relatives, and immediately create a challenge for them. The most important thing is that you can create your own team and immediately control the opponent. A player must be older then 13 Years minimum in order to play nba live mobile hack. Gamers can take part into Live events that held on daily and weekly basis. If you liked this article, Don’t forget to share it on Social networks. We will appreciate your suggestions below. Please keep your eyes on mmocs.com for more news about NBA Live Mobile. And now it is a good time to buy NBA Live Coins, they’re hot selling with lowest price and fastest delivery here. we also offer special discount for you. NBA’s mobile app is a mobile tie in NBA in Xbox One and PS4 life series, but graphics and games are not like you experience a console. Although it is not the same as the game machine, there are a lot of things to do, it has a good control effect on the screen. While the number one game on App Store is Pokemon go, NBA Live Mobile is in the second place, which is an app that basketball fans will want to check out. 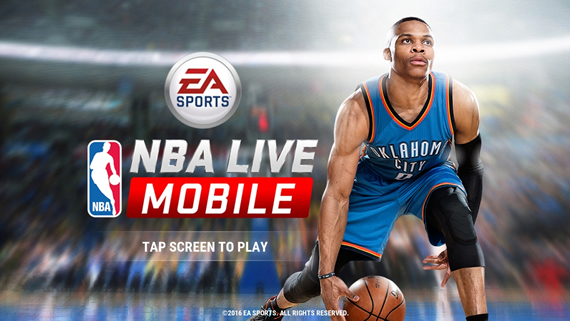 What is NBA Live Mobile? NBA Live Mobile is slimmed down version of NBA Live that works for short bursts of gaming that is common on a smartphone. You play short games and games to earn XP and coins, you can use to build your team. While this is not connected to the NBA live console, it’s very much like a mobile NBA LIVE ultimate team application that allows you to upgrade and play your iPhone or Android control in a team. NBA Live Mobile is a free download for iPhone, iPad and Android. If you cannot wait to level up and unlock coins form challenges and games you can buy your way to a better NBA Live Mobile team. There are NBA Live Pro Packs and NBA Cash options ranging from $1.99 to $99.99 in the NBA Live Mobile store. You don’t need to spend money to play, but if you spend the money, you’ll get a better team. If you want to prevent your child from spending money, you can disable the app purchase on iPhone. We’ve discovered some NBA Live Mobile hacks that promise unlimited coins and unlimited NBA Cash. All you need to do is enter your account information and the NBA Live Mobile Cheats Hack Tool will show you code that says it hacked the NBA Live Mobile servers. Upon completion, you need to click on the authentication button to enter your personal information or to sign up for the offer. These little work often and leads to increased spam. When you login to NBA Live Mobile you can save your progress and sync it to your other devices. This will also allow you to restore your progress if your phone crashes or if you get a new phone. You can login with Facebook, GameCenter or by email. If you choose not to register you can play as a guest for the time being. The most common problem with the NBA Live mobile is the game freeze tutorial or load screen.We recommend quitting the game and restarting your phone to see if it helps. Other issues include NBA site servers being repaired, but this is not a message that you will often see. Some users report trouble completing events and trouble completing tutorials. In this version of the game just arrived, you may need to wait for the update. More information about NBA Live Mobile, please focus on www.mmos.com, we’ll bring u the latest information and we’re professional and reliable NBA Live Coins online supplier. To buy NBA Live Coins here, we glad to share the beneficial code at first. NBA Live Mobile is a series of basketball video games which based on real NBA event. Gamers do not need to participate the real game but can experience authentic adventure. it has created a huge community since EA sports released it for the first time. According to EA Sports official data, numerous starters join this video game every day because of its excitement and challenging. Here is all information that beginners need to know before stating game. It turns out that beginner has a great possibility for suffering big loss if they copy the playbook of experienced players. Possibly the experienced players can get big reward when they has invested certain coins in one game mode, but if you follow him, you may get nothing at all. The player’s ranking level distinguishes one from anther. Here are four suggestions for beginners and help them to reduce the unnecessary loss. Build a Team with Precise Division – we all know the team constitution decides whether the game will success or not in the end. So beginners do not need to focus on how to find superstar players for they have no relevance to the result of a game. The most important thing that beginners need to complete is to keep balance between defense and offense. The defense and the offence are among the most important positions in the game, so they should choose such players who have highest overall stats to be defender and offender. Various Moves – There are certain moves which will make you a better player. Learning out new moves is an essential part of the game. There is nothing like the application of tough rocket science in order to learn these moves as you are just required to follow other quality guides. Moves like pump fake, spin, steals, hesitation and fade away are pretty effective. Just make sure, you follow a good source which reveals these moves in the correct manner. Every Achievement – On most occasions, players try to overlook the importance of achievements but they should be treated as an awesome way to earn more money along with card packs. If you really desire to focus on easiest achievements just opt for Season and general ones. With this, you would be able to earn some decent amount of coins just for building a better team or playing the game in a certain manner. Play Through Seasons – Many beginners don’t know they can earn coins by playing through season. Each game has the process of playing through season and it’s not impossible to complete. With the coin, beginner can buy their desired lineups and increase the strength of the whole team.